Befestigungsbügel angebracht und per Bolzen. TOP Blickfang coole Geschenkidee. bis zu 4 cm Breite getragen werden. Jedes Buckle ein Schmuckstück. TOP Blickfang coole Geschenkidee. Größe: ca. B 9,3 cm x H 6,4 cm. Befestigungsbügel angebracht und per Bolzen. Die nachfolgenden Vorschriften informieren Sie über Art, Umfang und Zweck der Erhebung, Verarbeitung und Nutzung personenbezogener Daten. § 4 Auskunft Sie haben ein Recht auf Auskunft über die zu Ihrer Person gespeicherten Daten und ggf. Wechselschließen werden im englischen Sprachraum auch Buckle genannt. Die nachfolgenden Vorschriften informieren Sie über Art, Umfang und Zweck der Erhebung, Verarbeitung und Nutzung personenbezogener Daten. Buckle Drachenkopf altkupfer. Maße: etwa 11 x 8 cm. und einer Breite von 4 cm. 1x Schnalle, unbenutzter alter Lagerbestand. Maße über Alles: ca. Länge: 80 mm / Breite: 50 mm. keine chinesische Produktion. Geringe Farb- und Größenabweichungen sind möglich. 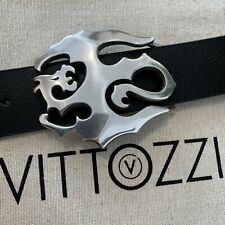 HIP-HOP BELT SUPERLATIVE - DRACHENMOTIV. 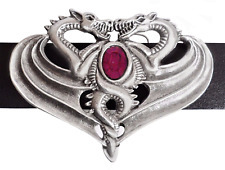 Buckle Drache altkupfer. Maße: etwa 8 x 7 cm. This Beautifully Made Belt Buckle Features a Celtic Knot & Heart Design. The Buckle is Designed in the UK and is Manufactured in the United States. The Buckle is a "Press Stud" type and will fit Buckle Belts up to 44mm wide. 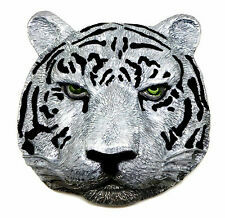 This Beautifully Made Belt Buckle features a 3D Siberian Tiger Head Design. The Buckle is Designed in the UK and is Manufactured in the United States. The Buckle is a "Press Stud" type and will fit Buckle Belts up to 44mm wide. This Beautifully Made Belt Buckle Features a Celtic Ribbon Design. The Buckle is Designed in the UK and is Manufactured in the United States. The Buckle is a "Press Stud" type and will fit Buckle Belts up to 44mm wide. 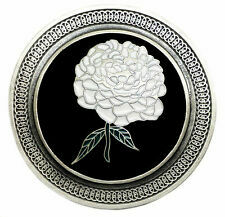 This Beautifully Made Belt Buckle Features a Single White Celtic Flower Design. The Buckle is Designed in the UK and is Manufactured in the United States. The Buckle is a "Press Stud" type and will fit Buckle Belts up to 44mm wide. 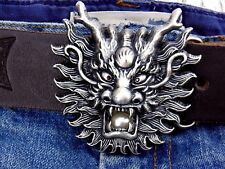 Most pewter Belt Buckles available are massed produced. 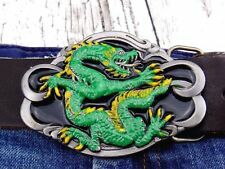 Our pewter Belt Buckles are hand made. All of our Pewter Belt Buckles, being hand finished, will differ slightly to that illustrated, and are therefore unique to you! The Buckle is Designed in the UK and is Manufactured in the United States. The Buckle is a "Press Stud" type and will fit Buckle Belts up to 38mm wide. 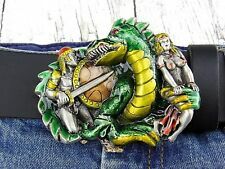 This is a Superb Quality Belt Buckle that will last for many years. 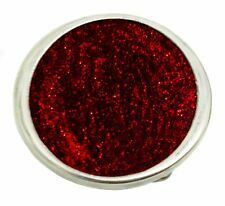 This Beautifully Made Belt Buckle Features an Oval Shaped Red Glitter Design. 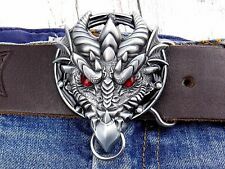 The Buckle is Carefully made with Hand Cast Pewter. The Buckle is Designed in the UK and is Manufactured in the United States. 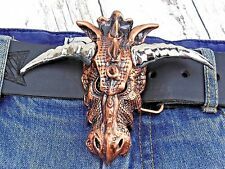 This Beautifully Made Belt Buckle Features a 3D "Vamp" Skull Design With a Chain Border. The Buckle is Designed in the UK and is Manufactured in the United States. The Buckle is a "Press Stud" type and will fit Buckle Belts up to 44mm wide. This Beautifully Made Belt Buckle Features a Celtic Leaf Design. The Buckle is Designed in the UK and is Manufactured in the United States. The Buckle is a "Press Stud" type and will fit Buckle Belts up to 44mm wide. 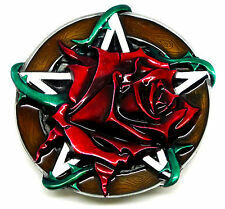 This Beautifully Made Belt Buckle Features a Celtic Flowers Design. The Buckle is Designed in the UK and is Manufactured in the United States. The Buckle is a "Press Stud" type and will fit Buckle Belts up to 44mm wide. This Beautifully Made Belt Buckle Features an Angels & Flowers Design. The Buckle is Designed in the UK and is Manufactured in the United States. The Buckle is a "Press Stud" type and will fit Buckle Belts up to 44mm wide. T his Beautifully Made Belt Buckle Features a Celtic Knot & Heart Design. The Buckle is Designed in the UK and is Manufactured in the United States. The Buckle is a "Press Stud" type and will fit Buckle Belts up to 44mm wide. Finished in 24ct GOLD Plate. This Beautifully Made Belt Buckle Features a Green Man Design with a Decorative Floral Border. The Buckle is Designed in the UK and is Manufactured in the United States. This Beautifully Made Belt Buckle Features a Celtic Floral Design. The Buckle is Designed in the UK and is Manufactured in the United States. The Buckle is a "Press Stud" type and will fit Buckle Belts up to 44mm wide. This Beautifully Made Belt Buckle Features a Circular Celtic Tree Design. With an Ornate Floral Border. The Buckle is Designed in the UK and is Manufactured in the United States. The Buckle is a "Press Stud" type and will fit Buckle Belts up to 44mm wide. This Beautifully Made Belt Buckle Features a Celtic Horses Design. The Buckle is Designed in the UK and is Manufactured in the United States. The Buckle is a "Press Stud" type and will fit Buckle Belts up to 44mm wide.